Alumna Gives $2.5 Million to Alexander Project. Find out more about Alexander Hall, its restoration, and how you can get involved. From 1900 to 1965, more than 700 students called Alexander Hall home. Alexander Hall, the 1893 Red Brick Building from which Seattle Pacific University emerged, has been officially designated for its historic significance by the City of Seattle Landmarks Preservation Board. But what some admire for its cultural and architectural distinction, others cherish because it was their home away from home. Until the mid-1960s, a lucky few ate, slept, and surveyed the campus from their roost above the Loop in Alexander Hall. 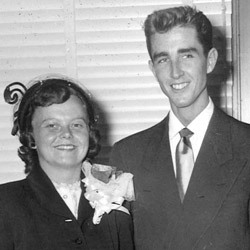 Don and Betty Jo MacPhee on their wedding day. Photo courtesy of Don MacPhee. But was it any more interesting than it was for Don MacPhee ’50, who lived with his cousin Bud Hansen ’50 (now deceased) on Third Alexander in the southeast corner room? Whatever the truth, their dating system worked. Betty Jo, also Class of 1950, married Don four months after graduation and 64 years ago this September. A demonstration in the foyer of Peterson Hall, where administrative offices were then located, featured women students carrying protest signs and singing “This Old Dorm,” the song which had won the Alexander-ites that year’s Campus Competitive Sing. And the women carried the day. The administration reversed its decision on the condition that the female residents of Alexander begin to restore the historic building by renovating the lounge. Reluctant, perhaps, to yield up all its secrets, Alexander Hall possesses a historic legacy that fired the passions of its most ardent residents. They knew they lived in a storied place. 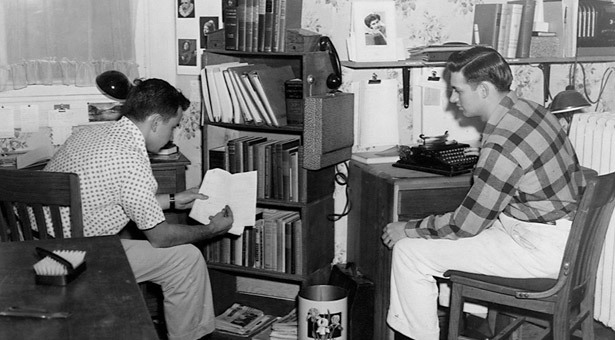 And by the 1964–65 academic year, they knew that its days as a dormitory were drawing to a close. For the last almost 50 years, Alexander has served as administrative and faculty offices. Gone is Don MacPhee’s non-regulation hot plate for making instant coffee and simmering a late-night can of soup. Gone are the bunk beds, the house mothers, and the occasional dorm uprising. As historic Alexander Hall, SPU’s first building, undergoes restoration this year, we welcome you to visit spu.edu/alexanderhall, where you’ll find historical photos, an interactive map of early Seattle, an opportunity to share your memories of the building, and many other features. You’ll also discover more about the Restore Alexander Hall project and how you can participate in the campaign going on right now to raise $7 million from alumni, friends, and those who treasure early Seattle-area architecture. Your gift will make a big difference to this and future generations of SPU students.